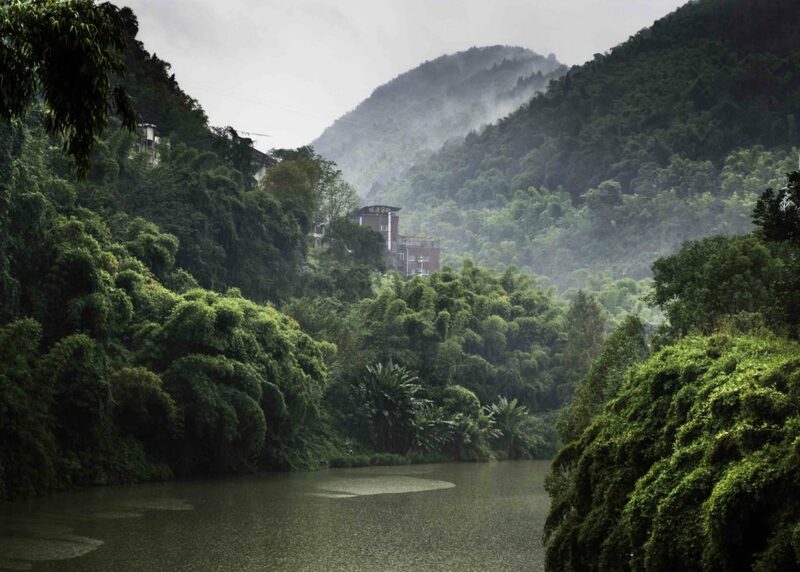 Hot Springs Site: Covering 9 miles (14.5 km) of area, the hot springs site encompasses mountain cliffs, verdant bamboo forests, rivers, springs, caves, waterfalls and river gorges home to the Chinese white monkey. With 48 springs feeding healing pools to choose from, it was hard to know where to start. Our own personal natural hot spring tub (43.2°C/ 110°F). The Villas: Seeing our own personal natural hot springs tub there was no longer any doubt about what to do first. We quickly lowered the shades around the hot tub, decreased the temperature of the water (from 43.2°C/110°F), shed our clothes and dropped into the 30°C/86°F water. After half an hour of restorative cleansing for body and soul, we were ready for a deep night’s sleep. Our elegant bedroom in the Villas. The Spa: The large modern reception area and dressing rooms in the spa are just the beginning. 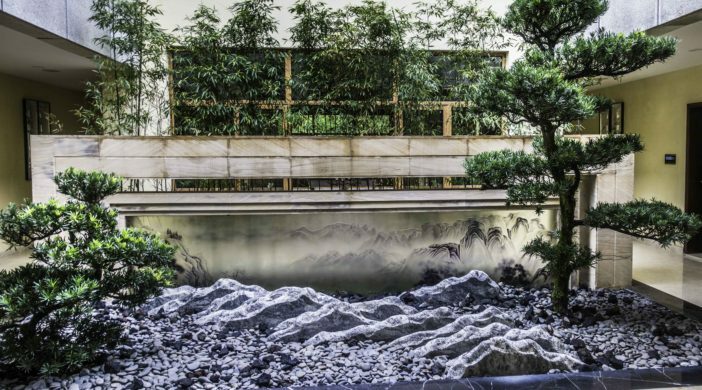 “Harmony between man and nature” is the theme in the quiet relaxing spa indoor and outdoor climate of mountain, bamboo forest and river views. 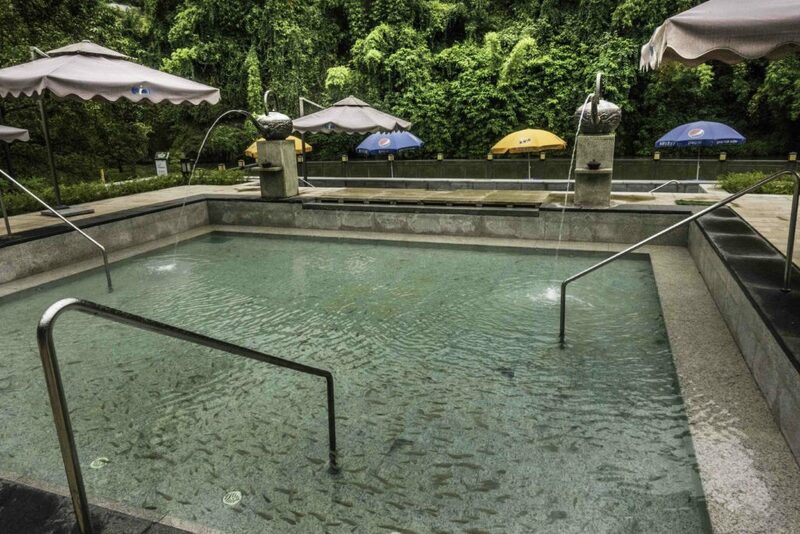 Natural cool water pools are available for work-out or recreational swimming and surfing. Large and small group healing pools have different temperatures and different mineral contents. 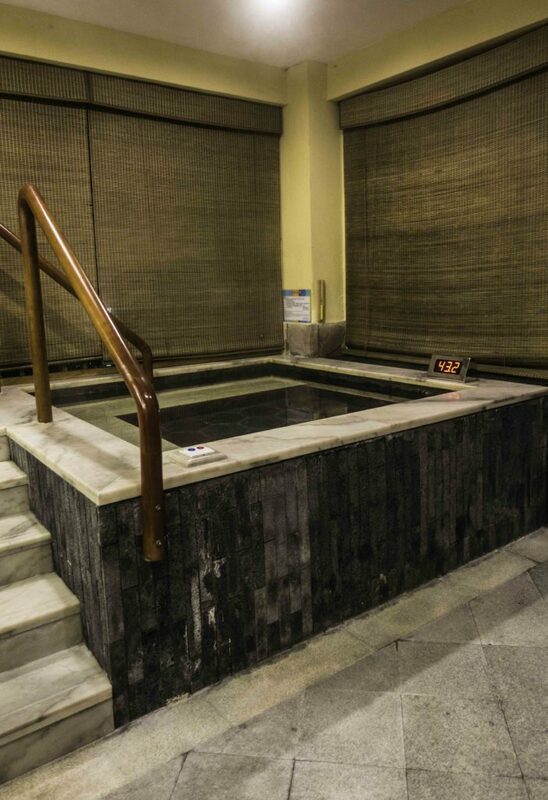 Indoor large therapeutic hot springs pool. High sulfur content hot springs pool. Chinese small fish dermabrasion pool. All spring pools are straight from the source, not recirculated, and with daily monitoring of water quality, nightly cleaning of the pools and weekly disinfection of the ground. 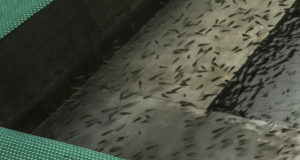 Pools with small fish specialize in Chinese dermabrasion. 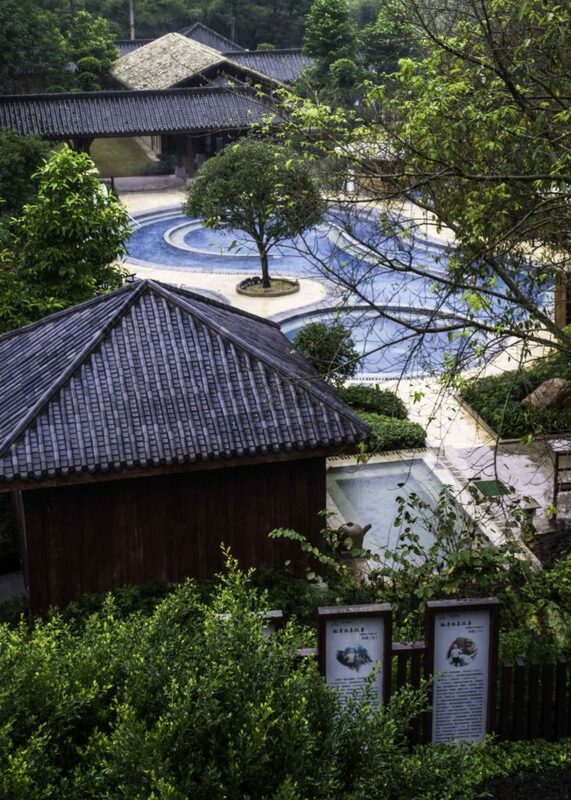 Other pools offer different Chinese ayurvedic options for qi nourishment, spirit uplift and Zen heart preservation. 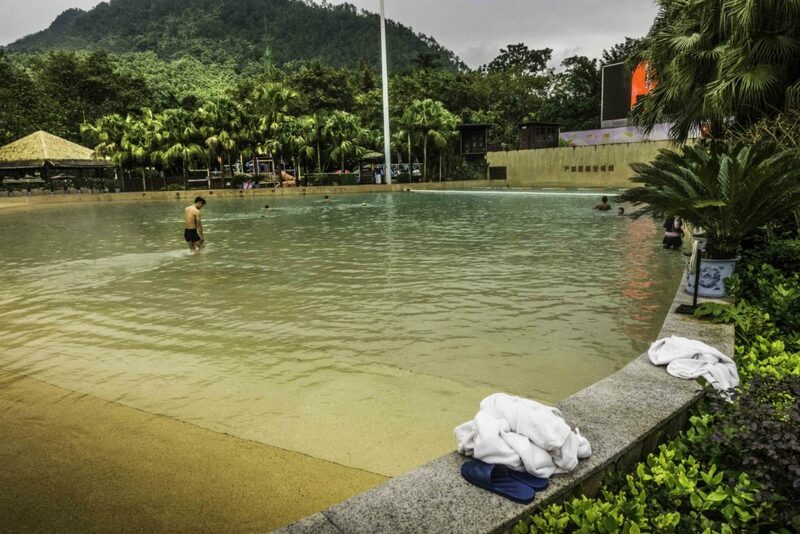 Included are sand, pearl, hang, herbal and “geographical proliferation” springs pools. 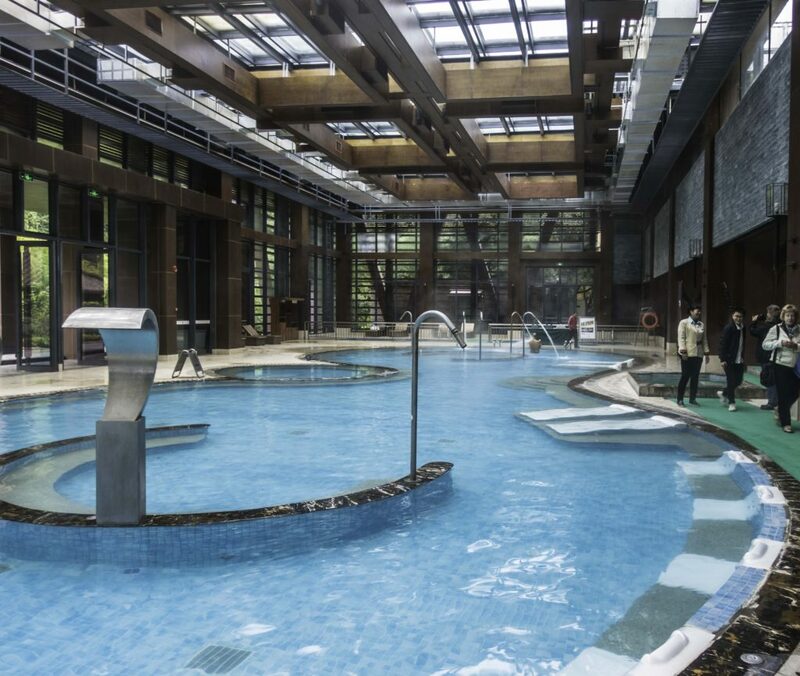 The hot springs are of the calcium sulfate type with a natural calcium carbonate buffering system that maintains the pH in a comfortable range (pH 7.7.) They are rich in sulfur, potassium, sodium, calcium and magnesium; with trace strontium, lithium, phosphorus, iron and zinc. Straight from the source, the waters are crystal clear. 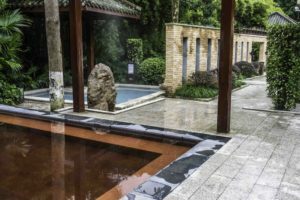 We didn’t have time to enjoy them, but spa services included physical therapy and a range of traditional Chinese and Western massages including hot-rock massages. Friends who tried the hot-rock and deep healing massages said the masseuses were excellent. Next time we’ll know better and allow more time. Our visit definitely needed more than just an overnight stop. Vanishing edge nature embracing hot springs lap pool. Recreational surfing hot springs pool. Fish “tickle” pool with Alice in Wonderland tea pots. Entrance to the “Small Three Gorges” on the Yulin River at Tongjing Hot Springs Resort. “Cruise Terminal” on the Yulin river. 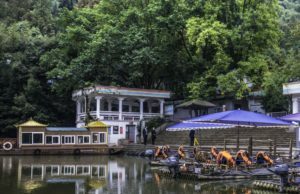 Small Three Gorges: Our morning walk took us to the nearby “cruise terminal” featuring boat tours into the Small Three Gorges as well as white monkey viewing at a cliff-side monkey care center. We opted for the morning white monkey cruise. Twenty minutes later we were surrounded by hungry hominids each seeking attention and feeding. The cruises are timed for monkey feeding time. With a diet of mostly corn and grains, visitors can throw the food distributed by the caretakers. Direct contact is discouraged, which is a good, because the monkeys have developed a craving for bright shiny objects including sun glasses, ear rings, watches and necklaces. 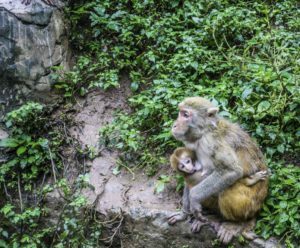 As the feeding wound down, the monkeys returned to their cliff side homes in the caves and we too needed to return to our metal cave in the bus taking us back to Chongqing city. 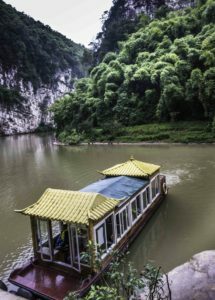 Next stop: A Yangtze river cruise in the Three Gorges. IF YOU GO: Try to stay two to three nights. Arriving late, our visit was too short and we missed out on the massage experiences, as well as, some healing hot springs. There are a range of accommodations to fit the budget. We stayed in a two room suite in the “villas” with its own private hot spring hot tub. The resort is presently off the beaten path for English-speaking tourists and, with favorable currency exchange rates, the room rates were reasonable. 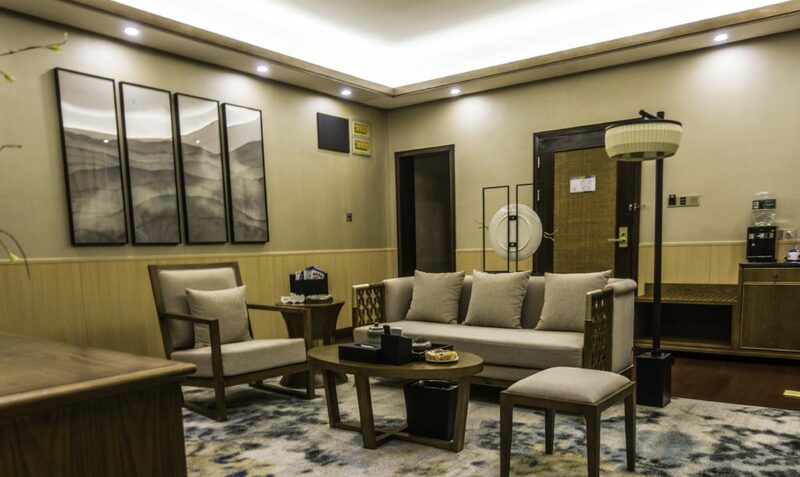 Modern neo-Chinese rooms, condos and budget hotel rooms are also available. The resort website can be found at www.cqtjwq.com (in Mandarin.) For help with the booking, (and language, visa and tour issues), we found Jimmy Deng and the staff at Spring Tour (http://www.spring-tour.com/) in Los Angeles most helpful (China@spring-tour.com .) 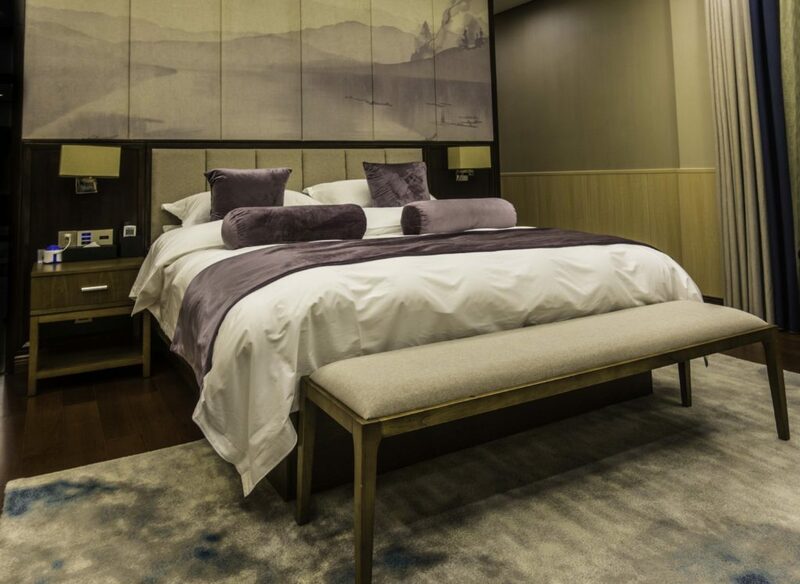 While their hotel rates were not always the lowest available online, they are one of the largest most reputable tour companies in China with their own fleet of aircraft. Following the old adage, ‘you get what you pay for’, we used Jimmy. Be advised that there are very few English-speaking Chinese, especially when you need them so, if you don’t speak Mandarin, advance planning is requisite. English-speaking tour groups are definitely an option worth considering. Harmony between man and nature in hot springs pools. Sounds fantastic! And, looks beautiful! Definitely worth a stop! I feel rested and relaxed just looking at the pictures! From Rhonda: Really looks cool. 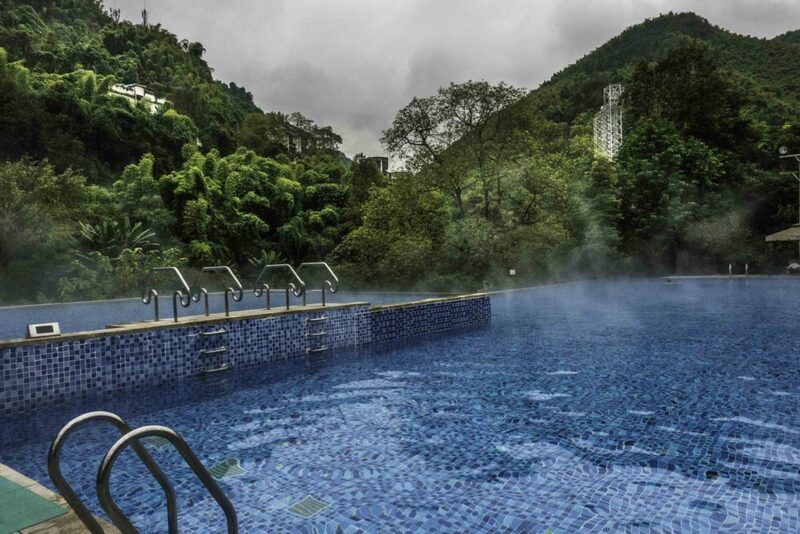 I have been to several hot springs in China but this one looks a notch (or two or three) above any of them! You got a real treat! Sounds like a winner! We love hot springs.